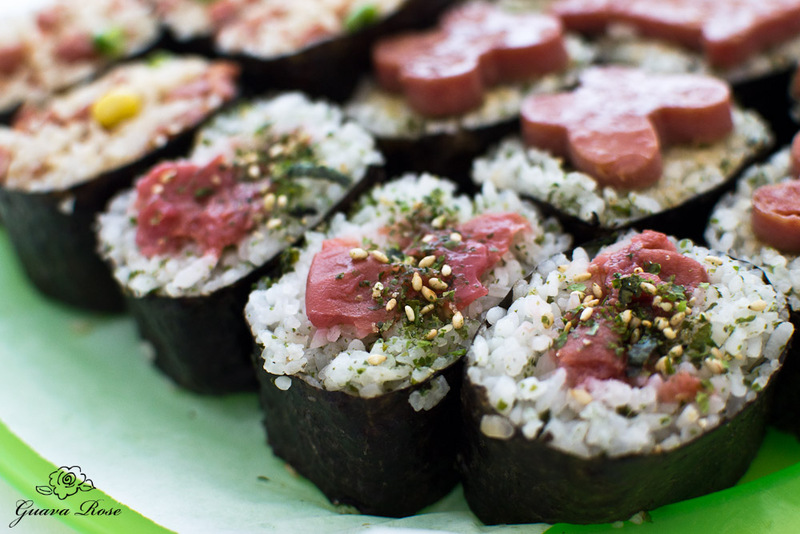 Spam musubi– a perennial favorite. 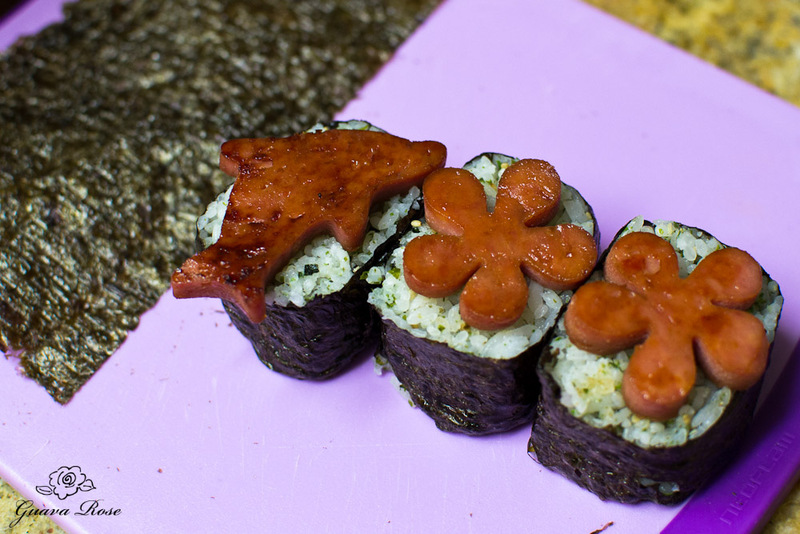 A slice of spam sandwiched between rice and wrapped in seaweed. How could I fancy it up? 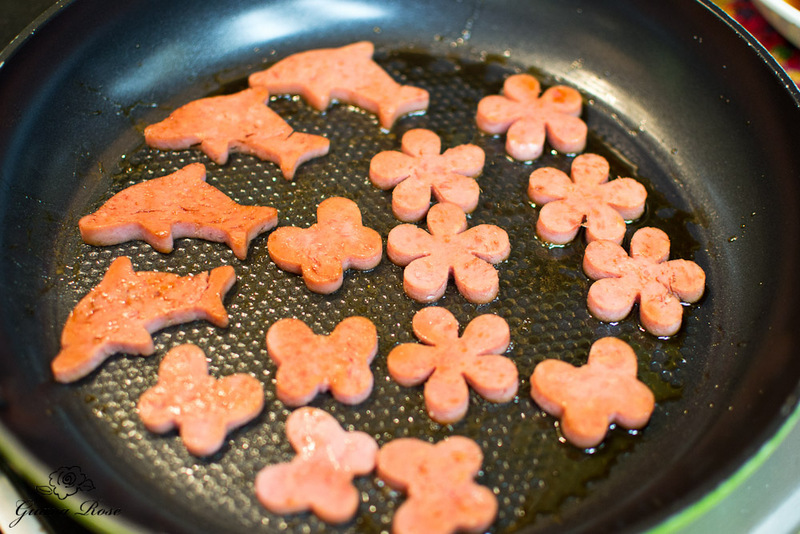 Hmm…what if I cut the spam into fancy shapes? I like to use Lite spam. Although lower in fat, sodium and calories than the regular spam, it’s still not exactly a healthy food, but it’s a better choice. Slice one block of spam into ten slices. From each slice, cut out two shapes with 1-1/2″ to 2″ cutters. Here I used some flower and butterfly shapes. A larger cutter like my dolphin up in the corner, took up a whole slice of spam. So how many shapes you are able to get depends on the sizes and shapes of your cutters. Fry up the spam shapes in a mixture of sugar and shoyu. 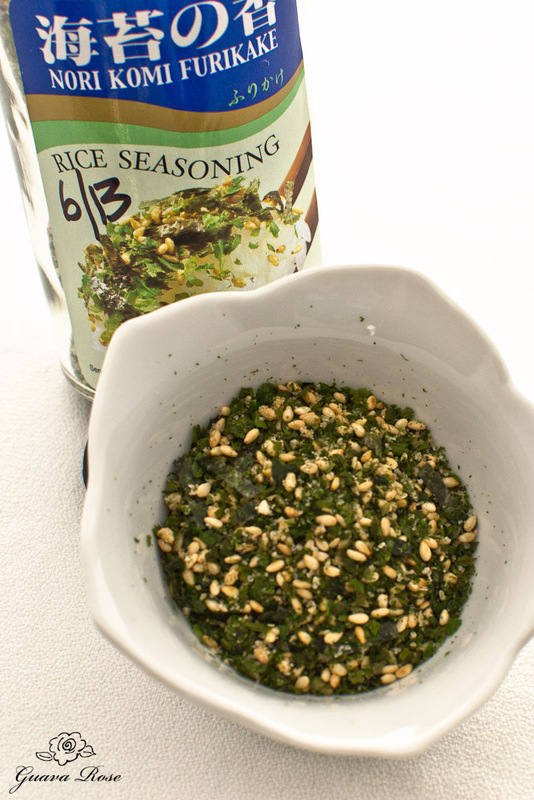 I like to season the rice with a little furikake. My family doesn’t like the ones with ground fish flakes in them, so I just stick to the basic seaweed and sesame seed ones without MSG. The ingredients on this jar are just sesame seeds, salt, sugar and seaweed. 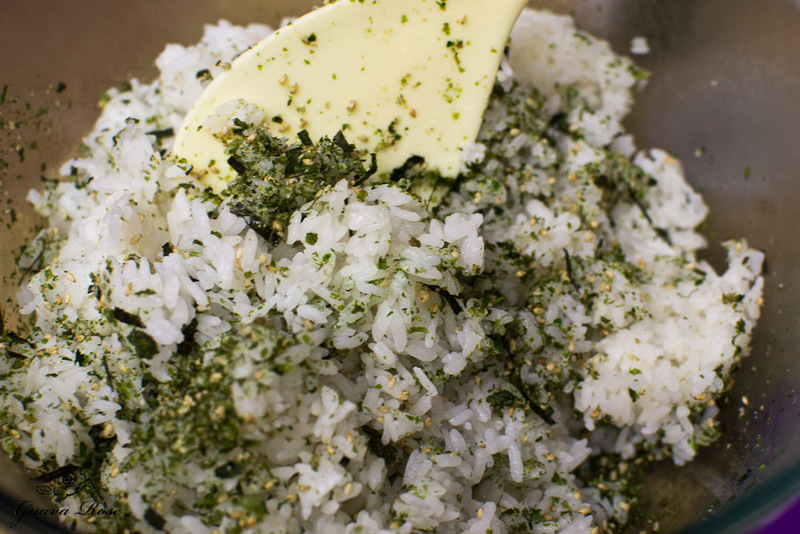 Gently mix the furikake into freshly cooked short grain rice. Remember to let the rice keep steaming after the rice cooker has turned off. Keep the cover closed and let the rice sit for at least 20 minutes. If you’re too anxious and use the rice right away, it will still be a little too firm and not as pleasant to eat. This step is really optional, but I prefer to toast my nori (seaweed). Just hold it 2-3″ over the stove and wait for it to turn slightly green, and tighten up a bit. Toast the other end, then the other side. Watch it carefully so it doesn’t burn. 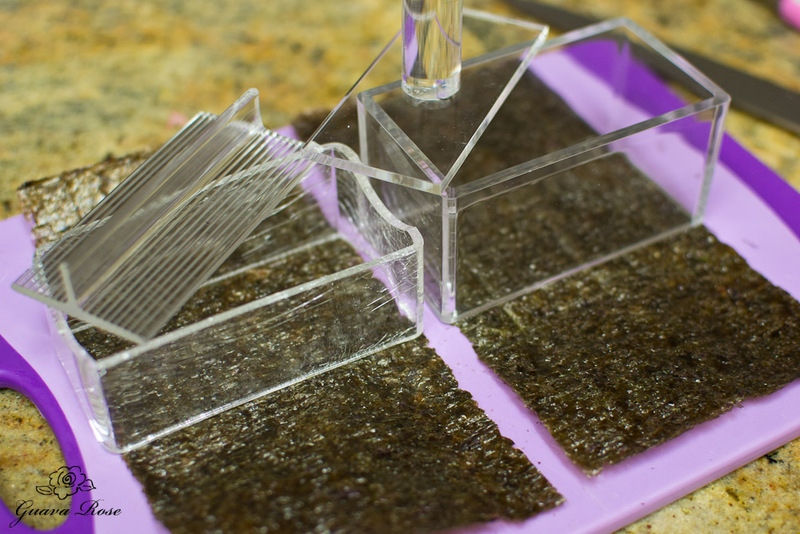 Stack up the nori and cut the sheets in half on the long edge. 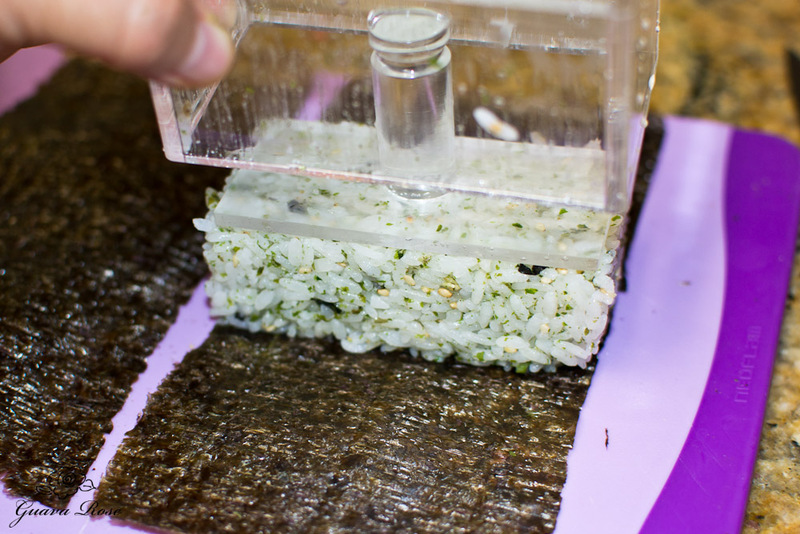 Dip the bottom portion of the musubi mold into water to help keep the rice from sticking to the mold. Since this dish was shallow, I just flipped it over so both ends were moistened. 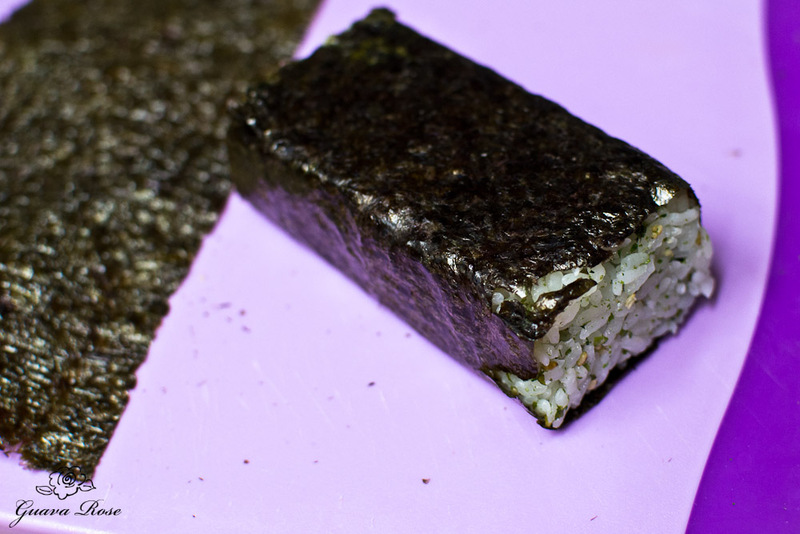 Place a slice of nori (rough side up) vertically on the work surface, then place the moistened musubi mold across the middle. 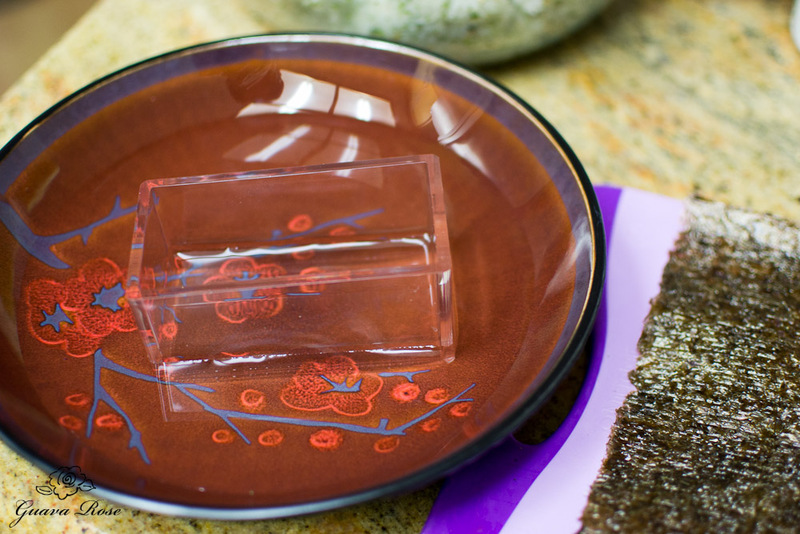 The short edges of the mold should line up with the long edges of the nori. 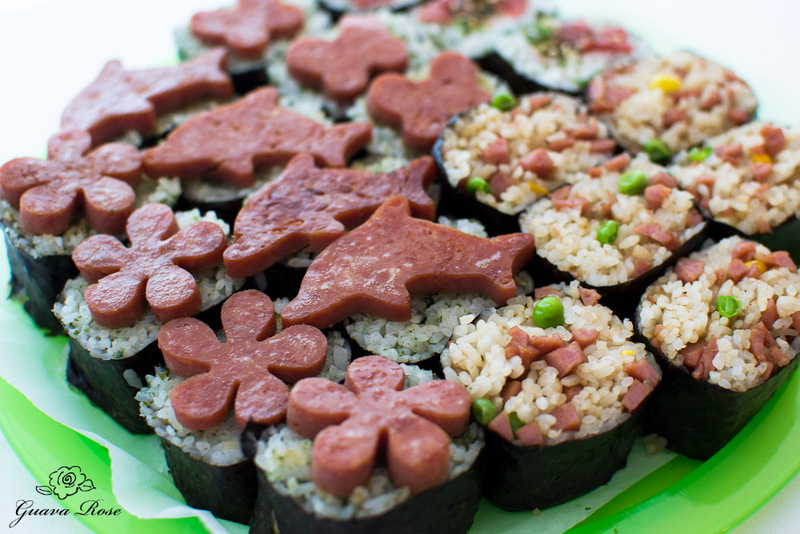 Here you can see two spam musubi molds. The one on the left is my older one; it’s shorter and wider. My newer mold on the right is taller and narrower. The taller, narrower mold works better in this case since I want a larger surface area of rice (after I cut each into 4 slices) to press the spam onto. Fill with about 2/3 cup of rice. Wet the top handled portion, place into the mold and press rice down firmly. Lift the bottom portion of the mold up first, then remove the top handled portion. Fold the sides of nori over the block of rice. Place seam side down and let it set a bit while you roll the rest. Slice each musubi crosswise into four pieces with a sharp knife. Wetting the knife in between slicing will help keep the rice from sticking to the knife, as well as make it easier to slice. Press a spam shape onto the top cutside of each piece. Remember all the leftover spam after cutting out the shapes? 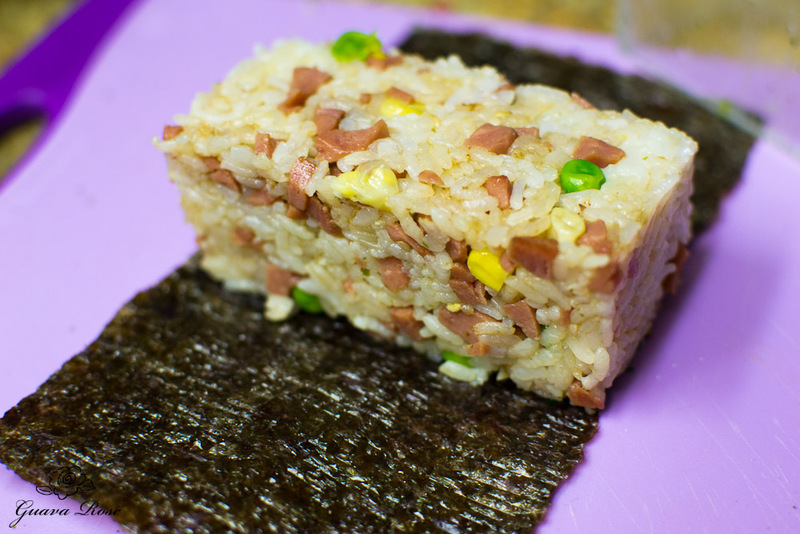 Dice it all up and you can easily make some tasty spam fried rice to eat, or to roll up into some fried rice musubi. Halloween or Thanksgiving: pumpkins; Christmas: Christmas trees and gingerbread men; New Year’s: Stars; Valentine’s Day: Hearts, lips, X’s and O’s; St. Patrick’s Day: Shamrocks; Easter: Bunnies, chicks and eggs. 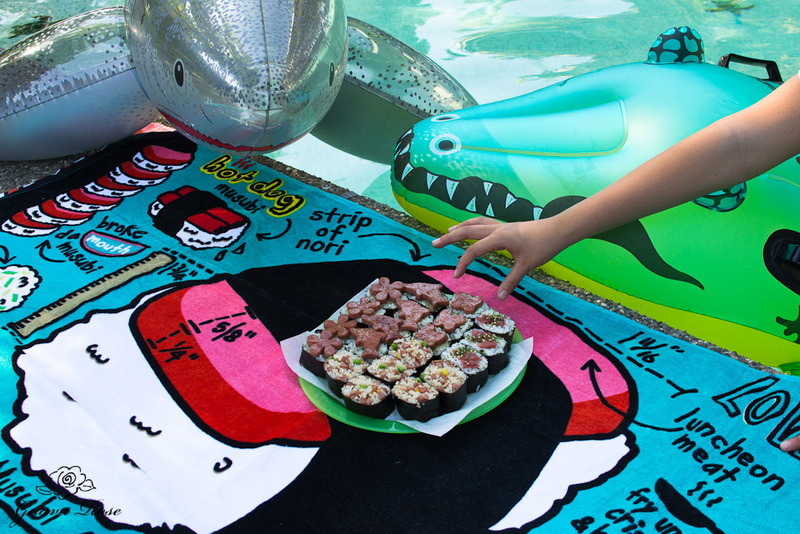 Whoa, even the water creatures have sniffed out our stash of musubi. 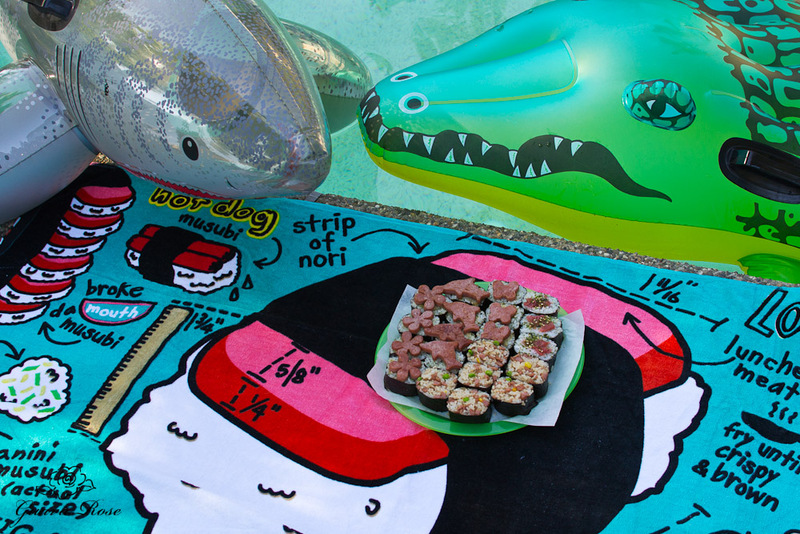 Couldn’t resist this cute spam musubi beach towel from Foodland when I went back home during the summer. Wish we had some tako poke too. These 90 degree days in mid-October certainly feel like picnic and pool weather. 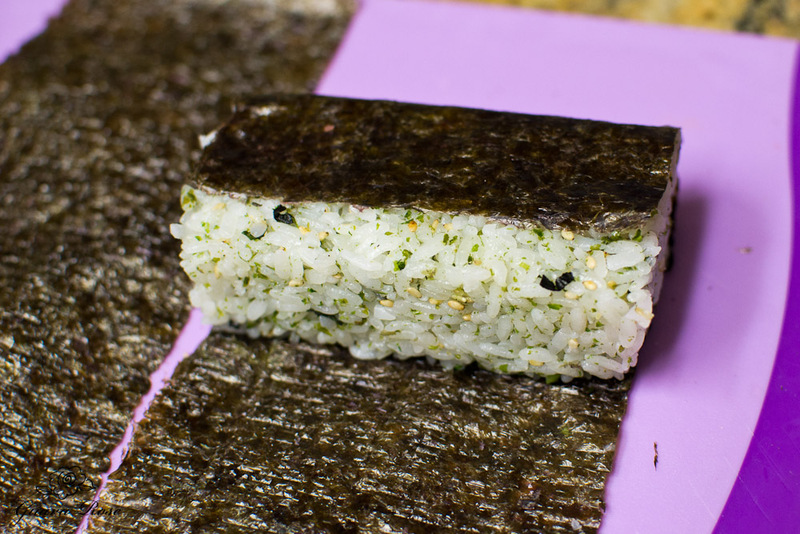 Of course whenever I make spam musubi, I always have to make some meat-free ume furikake musubi for Quill. Look what happened as soon as I said I was done taking pictures–the water creature coordinator (a.k.a. Laurel, treading water in the pool) immediately reached out to grab a butterfly spam musubi. Slice Spam into 10 slices. 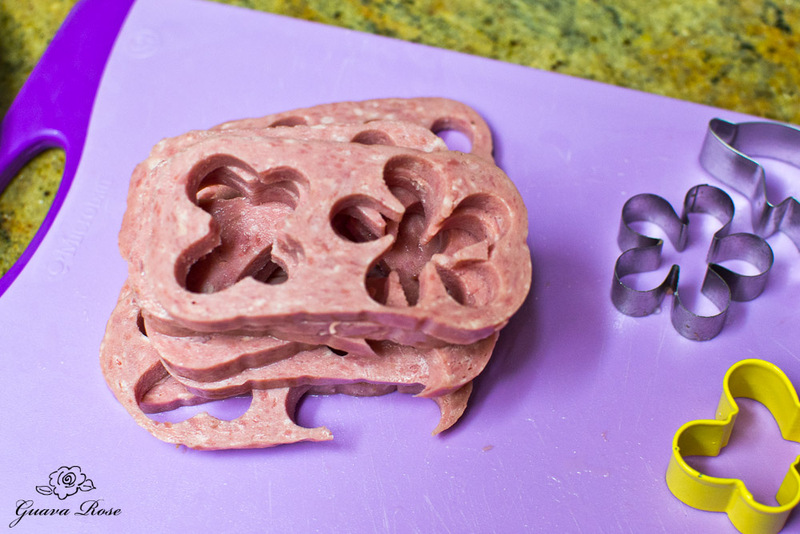 Use small 1-1/2" to 2" cookie cutters to cut two shapes out of each slice of ham. You can use slightly larger cutters if you don't mind the spam hanging over the edges of the musubi. 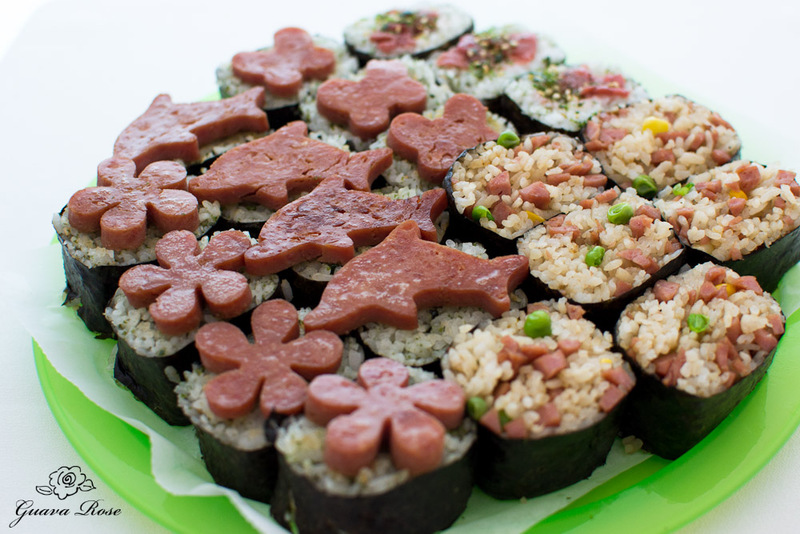 Set aside the used spam pieces for another use or to make spam fried rice or spam fried rice musubi. Place sugar and soy sauce in a non-stick frying pan. Swirl around liquid to dissolve sugar as much as possible. 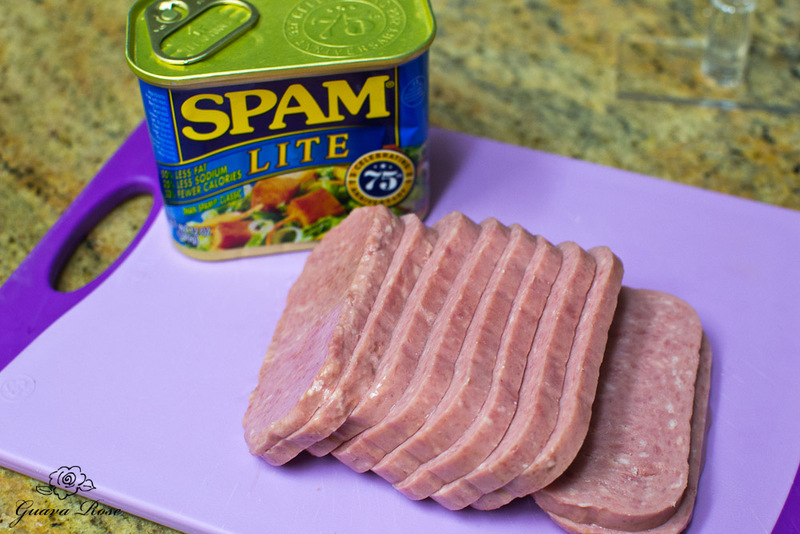 Place spam cut-outs in pan and coat both sides of spam with sauce. Place pan on medium high heat. Fry spam, turning occasionally until most of the sauce is evaporated and the spam is browned. Remove spam from pan and set aside. Turn electric stove burner on high. Place each sheet of nori 2-3" above the heat to toast. 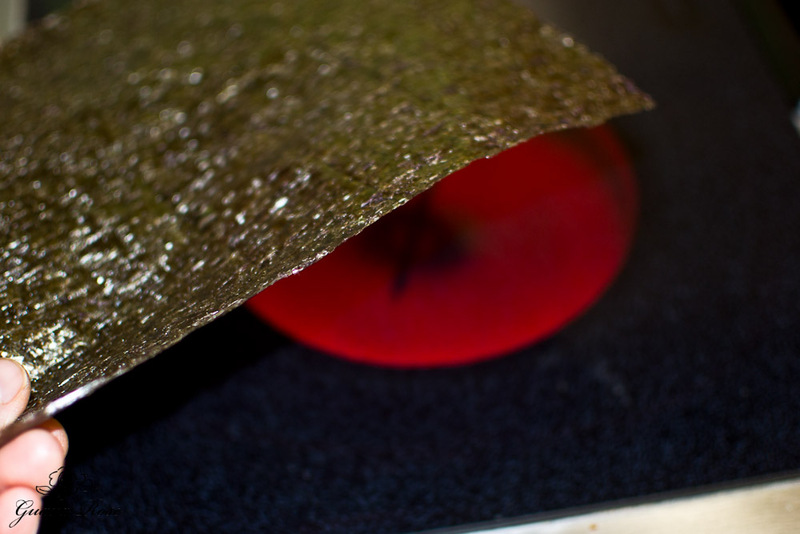 Hold until the nori turns slightly green and "tightens" up a bit. Be careful not to burn it. Toast both sides. 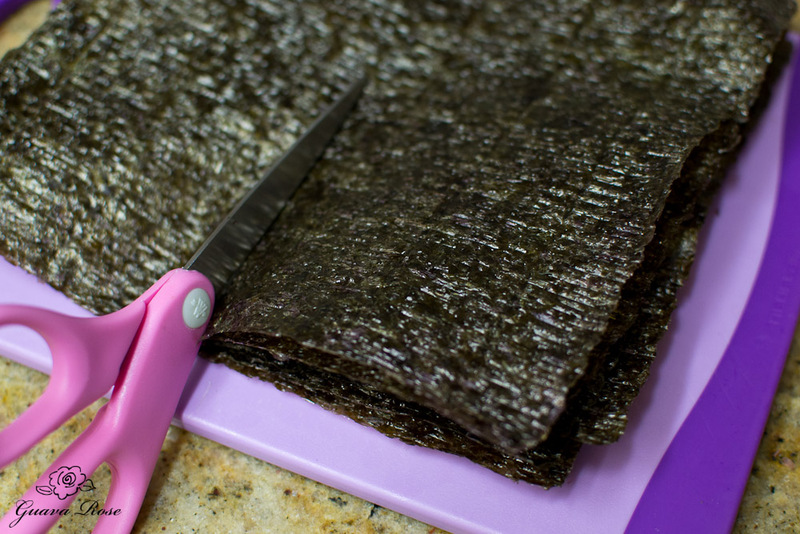 Stack up the sheets of nori and cut them in half on the longer edge. You should have 6 pieces that are 4-1/4" x 7" each. Set one piece aside for another use, or to roll another musubi if you have extra rice. Fluff rice and gently mix in furikake with a rice paddle. Place one piece of nori vertically on a flat surface. 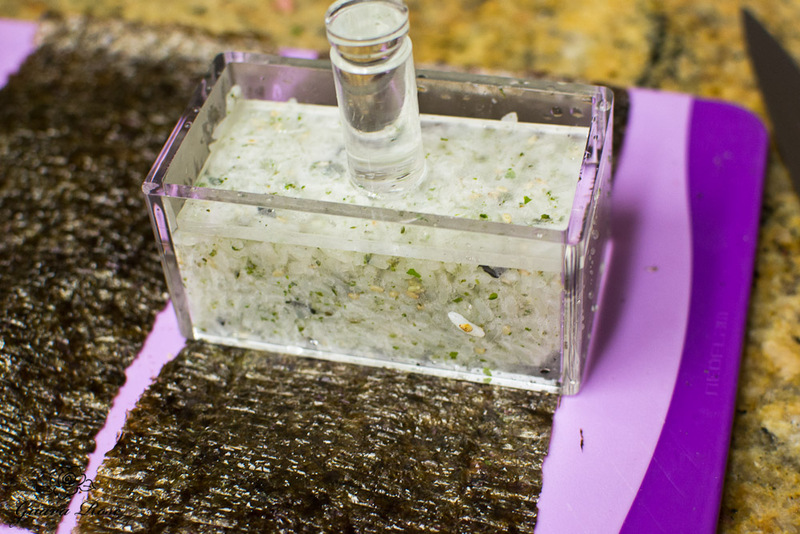 Dip the bottom portion of the spam musubi mold completely in cold water, shake off excess water, and place horizontally across the middle of the piece of nori. Fill with ⅔ c. furikake rice. Dip the handled top portion of the spam musubi maker in water, fit it into the top of the musubi mold and press down firmly to compress the rice. Hold the top down, pull the bottom mold up over the rice. Take the top portion of the mold off. Now wrap the top portion of nori down over the rice, and then fold the bottom portion of the nori up over the rice. Place on a plate seam side down, and repeat with the remaining nori and rice. Slice each rolled musubi crosswise into 4 slices. Use a sharp knife and wet it between each cut to help prevent the rice from sticking to the knife. Lay each slice cut side up and press a spam shape on top.